Almost a month after his plane plunged into the Pacific, U.S. Army Air Force bombardier Louie Zamperini was weary of sharks circling his life raft. As Laura Hillenbrand details in her New York Times bestseller Unbroken, dozens of sharks were tracking Zamperini&apos;s every move, waiting for him to fall in the water and become their next meal. That was in 1943. Since then, the number of sharks in the world&apos;s ocean has declined by as much as 90 percent, and being adrift at sea isn&apos;t quite as scary a prospect as it would have been three-quarters of a century ago. So, which ocean is the healthy one — Zamperini&apos;s shark-infested waters, or the one where more than 70 million sharks are harvested annually for soup? In order to know if the health of the ocean is good or bad, getting better or getting worse, we have to know what our targets are. Targets are points of reference for assessing current ocean status, and they depend on personal perspective. Catching fewer fish is good for conserving biodiversity, but bad for food security and fishermen. An increase in coastal tourism may be good for local economies, but bad for working waterfronts. Assessing health in light of these often-conflicting desires requires setting targets; developing reasonable targets has been one of the foremost challenges in creating the Ocean Health Index. Before we get too deep into the issue of perspective, why bother setting ocean health targets at all? First, it&apos;s important to clarify exactly what a healthy ocean looks like. Clarity is essential for science, and equally essential for communicating beyond the scientific arena. It forces us to choose targets that are scientifically defensible. Quantifiable targets can provide policymakers with the raw materials to create ocean regulations that have teeth. In addition, by bringing the endgame into focus, ocean health targets make it possible to track progress toward recovery in less healthy places and celebrate successes in others. Think about your reaction if your doctor told you that you need to lower your cholesterol, but didn&apos;t give you a target number to shoot for. Would you be motivated to make lifestyle changes? Not likely. How would you know if you were making significant gains? You wouldn&apos;t. These same issues apply to measuring ocean health. So what are we aiming for? What do Ocean Health Index targets look like? Simple questions, complicated answers. We have defined targets that are ambitious, yet achievable, conditions in a healthy ocean. 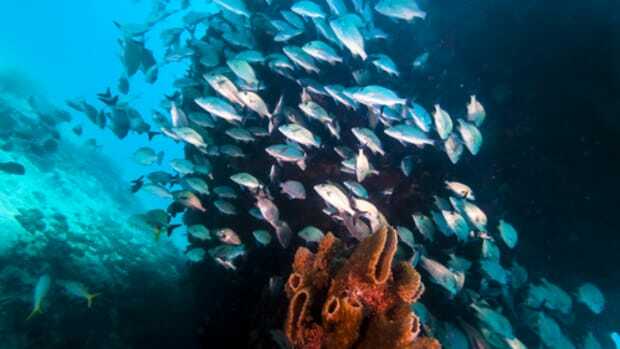 Two examples include a biodiversity target to reduce the number of species listed as threatened and endangered, and a target for marine livelihoods that strives to maintain or increase the number of jobs, job quality, and economic revenue in marine sectors. Our focus on achievement is intentional, and contrasts with an alternative approach which would have framed the Ocean Health Index around limits, or what to avoid. It&apos;s analogous to Zamperini deciding to focus on getting rescued while he was adrift at sea, rather than choosing to make his goal not dying. Sometimes a simple mental shift can make a big difference. A focus on targets is much more constructive than a focus on avoiding negatives. The example targets above for biodiversity and marine livelihoods put into practice the notion that a healthy ocean is not a pristine ocean, empty of human beings. We have embraced the idea that people are central to creating and maintaining a healthy ocean. It allows us to establish targets that are ecologically and socially realistic. The Ocean Health Index evaluates the current status of each benefit against its target. There are 10 benefits, each with several subcategories. For instance, one of the things people desire from the ocean is food, and food can be obtained from both wild fisheries and aquaculture, so there will be separate targets for each. The targets for each benefit come in two flavors. One measures the current status of a particular benefit compared to the best possible value. This type of target is similar to human health targets, such as keeping our cholesterol under 200 or maintaining a normal body temperature of 98.6 F. For example, fishing too much — or not much at all — can, in the long run, lead to lower catches than would fishing just the right amount. Fish too much and you might not leave enough adults in the water to populate the next generation; some stocks will not replenish themselves as quickly as they could. Fish too little and you&apos;re not catching as many fish as you could. So the Ocean Health Index relies on a target of harvesting the maximum sustainable amount of seafood from wild fisheries in any particular place. The other type of target measures current ocean condition relative to where we&apos;ve been. This is similar to the targets we think of for the economy. For example, what is the value of the GDP relative to last year, or what is the Dow Jones Industrial Average today relative to where it was last week? In the case of the Ocean Health Index, for example, we compare the historical capacity of mangroves and other coastal habitats to regulate climate through carbon storage 30 years ago to their capacity to do so today. As we mentioned above, setting targets has been a challenge because people enjoy and use the ocean in so many different ways. To address this issue, we have designed "selfish" targets for the Ocean Health Index. That is, we define what is to be achieved for each ocean benefit one at a time. The target for sustainable seafood is not mindful of the target for maintaining biodiversity. The target for maintaining biodiversity is set without concern for the desired state of coastal economies. And so on. Some of our peers have argued that targets set one at a time reveal a fatal flaw because ocean benefits don&apos;t exist in isolation. In fact, our approach embraces this idea. We know that the different choices we make about how to manage the ocean have costs and benefits. Necessary trade-offs emerge in the Ocean Health Index because what&apos;s good for achieving a target for one part of ocean health might not be so good for another part. Communicating this push and pull of different ocean uses as plainly as possible has been a cornerstone in our work. The solution we&apos;ve decided upon is not a perfect one, but it is the best we can do given current scientific understanding. In addition, the target-setting approach we&apos;re using is not as strange as it may seem at first blush-we see it all the time in reports on economic indicators. Targets for all of them are defined to encourage growth. However, it is usually the case that not every economic indicator can increase at the same time. If new home sales decline, the fraction of occupied rental properties will increase. Similarly in the Ocean Health Index, if tourism and recreation attain target levels in a particular place, chances are that water quality will not achieve its target because of the pollutants associated with coastal development. Measuring ocean health requires knowing where you want to be, and recognizing that not everybody will feel similarly. To answer the question of which ocean is the healthy one — Zamperini&apos;s ocean, teeming with sharks, or an ocean that is (seemingly) safer for people to swim in, the answer is definitively both. The Ocean Health Index allows these tensions to materialize organically and transparently. And, while Zamperini (or our mothers) are never likely to believe that it is healthy for us to swim in an ocean teeming with sharks, we may be able to convince them that some people probably feel otherwise.